11 photos of this Royal Navy light cruiser, the only ship still afloat to have fought in the 1916 Battle of Jutland against the German Navy. She was built in 1914 in the record time of 11 months by Cammell Laird of Birkenhead. At first she had eight 4in and two 6in guns, but later mounted four 6in guns. Torpedo tubes were also carried. Caroline had a crew of 325, and could make up to 28.5 knots. Her turbine machinery survives, but not her boilers. She became a drill ship in 1925, and served as such in Belfast until decommissioned in 2011. Her future is now uncertain, though scrapping is inconceivable. 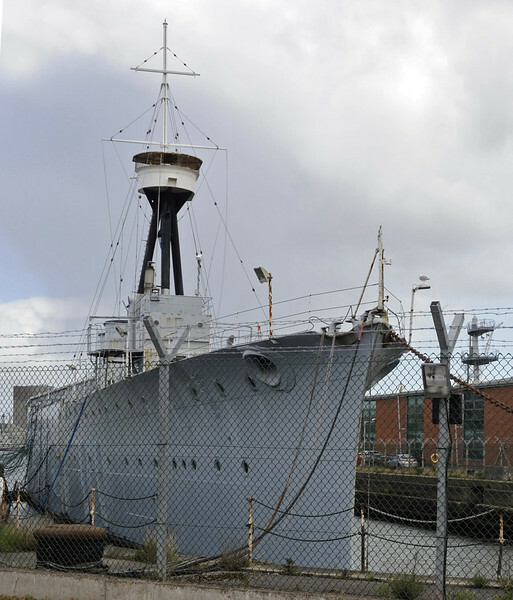 HMS Caroline, Alexandra Dock, Belfast, Tues 15 May 2012 1.